Reading is something many people enjoy whether for pleasure or for learning, however it is one of the most vital skills a child can learn and continue developing as they age. Books offer many things, including a place where one can go and explore a world using their imagination and the words written in the book. Reading is often a hobby, but when a child is learning to read it often becomes another part of school and they might not enjoy it as much as they want. When a child looks at reading as more of a chore than something fun and exciting, it can be very challenging for them to enjoy it or develop a love for it. For this reason, we’ve provided a few quick and simple tips that can help you instill the love of reading in your child. Yes, your child should view reading as fun, not a chore. So how can you do this? When reading to your child, always use an enthusiastic voice. Pretend you are the character so when you read each line, your child feels like they are inside the book, listening to the actual character. There’s nothing worse than someone reading to children with a monotone or robot-like voice; even most adults don’t enjoy hearing stories this way. 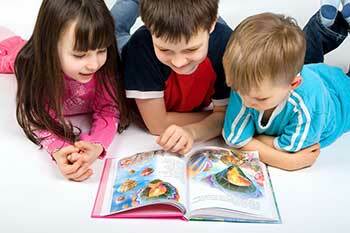 If your child is reading to you, encourage them to use their expression to accentuate each word and sentence. Taking their reading experience to a completely new level by using fun, silly voices for the humorous lines and changing your voice to depict the style of each story, your child can begin having fun with reading. Most children love to have their own library card and visit the library frequently to check out whatever and however many books they choose. In addition, you will find a wide variety of books in your child’s reading level to help them develop their reading skills further. Using this process for enticing your child to read, they will start realizing which books they enjoy the most and have a sense of accomplishment in that they get to choose every book. Visit your local library often so they can always have a stack of fun books to read on hand. You might also consider asking the librarian about any suggestions on activities and resources that could help your child. In addition to reading at home, consider taking books instead of toys or electronic devices when you go on road trips. While reading books is a great way for children to develop their reading skills, there are other ways to help. This includes reading everything, everywhere. Let them read the cereal box while they’re having breakfast, read the menu at the restaurant, road signs as you pass them, etc. The more your child is exposed to reading, and reading a variety of material, the more they will begin to enjoy it and it becomes natural for them; not a chore. Utilize these tips to help nurture your child’s love and enthusiasm for reading. To see how Read Smart can help your child’s reading, contact us today.